Promotions and demotions were announced by the Twins on Sunday, but starting pitcher Kyle Gibson was not among the names mentioned. Instead, starting pitcher Adalberto Mejia is on his way to Triple-A Rochester, along with reliever Buddy Boshers, while Kennys Vargas was recalled and long reliever Justin Haley was placed on the 10-day disabled list. But it’s Gibson who should be headed to Triple-A Rochester, not Mejia. Or trade him. Or release him. Or send Gibson to the bullpen because he has shown that he cannot pitch with much success. He hasn’t shown a consistently winning form throughout his career with the Twins and it certainly didn’t happen on Sunday after the Detroit Tigers won 13-4. Gibson lasted all of two-plus innings and gave up eight hits, seven runs (six earned), two walks and surrendered one home run. He’s now 0-3 on the season with an ERA of 9.00. Mejia, on the other hand, hasn’t pitched that poorly and, frankly, appears to have received a quick hook from management. In Mejia’s last start, he didn’t figure in the decision. 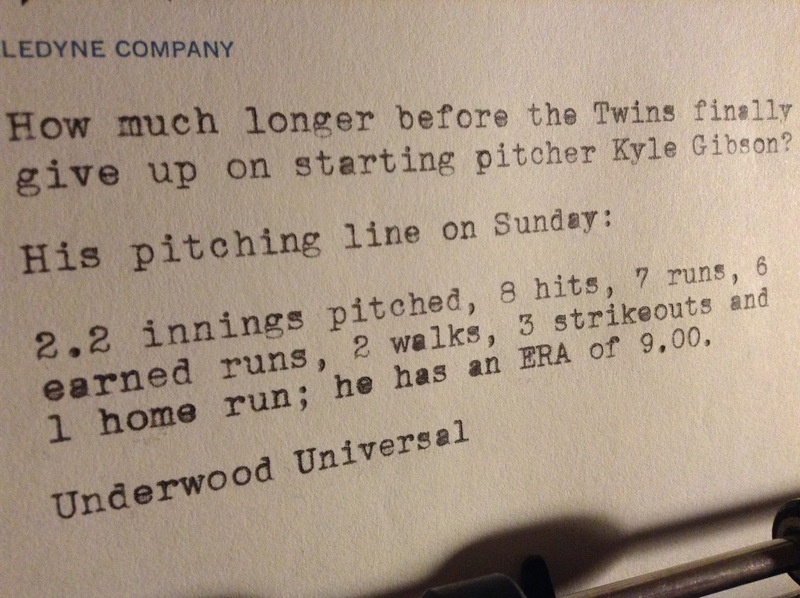 He, too, lasted two-plus innings in a 5-4 loss to the Tigers, but he also struck out six over that span. Before his demotion, Mejia was 0-1 with a 5.79 ERA. -After Sunday’s loss to the Tigers, the Twins fell to 8-10 on the season. -The Twins showed some fire on Saturday after Miguel Sano took offense at a pitch thrown behind him, which ultimately led to his ejection and a benches-clearing shoving match, if not a brawl. Twins pitcher Justin Haley followed that by hitting Tiger JaCoby Jones in the face. And it made me wonder: Where was this fire in 2016? You would think that during a 100-loss season that a few punches would have been thrown, but apparently not. At least I don’t remember a benches-clearing brawl last season.